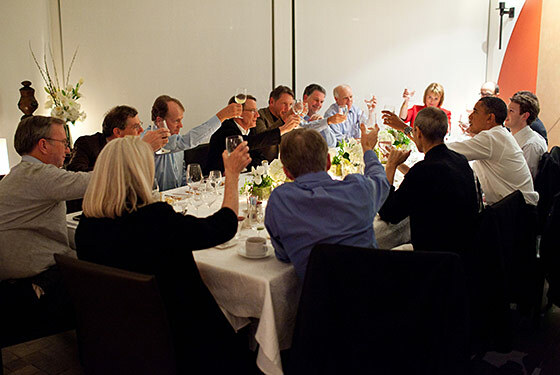 President Obama dined with a dozen tech titans at the Woodside, California, estate of venture capitalist and “deep-pocketed political donor” John Doerr last night. Among those with whom Obama “discussed his proposals to invest in research and development” were Apple’s Steve Jobs, Google’s Eric Schmidt, and, of course, boy-king Mark Zuckerberg of Facebook. “It would really help me out of a bind if you paid off our national debt,” Obama is probably saying here. And here’s what it looked like when they all toasted.